You know you’re in the countryside when the cottage you’re renting was renovated by the man standing next to you in the toilet of the boozer. 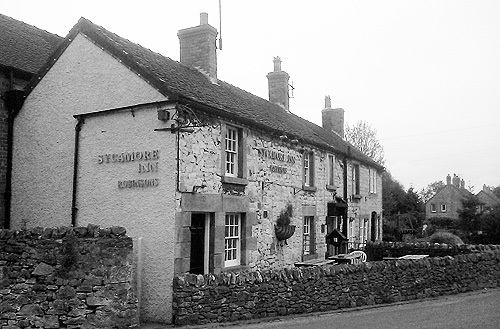 The Sycamore is a classic English village pub, overlooking the village green, seemingly at the heart of local life. Parwich is a smattering of stone-built cottages, home to a few hundred people. “How are you liking the cottage?” one of them asks me, while I’m taking a leak between pints. Just as well I’m liking it very much, as he goes on to explain that he built the fireplaces and redid all the walls. He turns out to be one of the couple who run the pub as well. This explains the wry smile his other half gave when I arrived in the village and went into the Sycamore for directions, and asked if she happened to know the cottage. Of course, I discovered later, her mother owns the cottage. Everyone knows everything around here – sometimes even more closely than you expect. I’ve often wondered why, when English village pubs and village shops are disappearing fast, the two don’t combine under one roof. (It seems to work for the Irish, doesn’t it?) And blow me if that isn’t exactly what’s happened here. Helped by a scheme called Pub is the Hub – which, in turn, is supported by breweries, pub trade bodies, the Post Office and Camra – the Sycamore has converted one of its rooms into a small retail operation. This is as win-win a situation as you can get. Go for a quick pint and you can stock up on beans and floor polish; pop out for a paper and you can sit down for a beer while you read it. The people of Parwich are clearly having their cake and eating it. And their pint, and drinking it. It’s a Saturday night and we’re here on holiday, brothers, girlfriends, my mum, my son. At the end of a sweltering day we slump into benches outside and wait for dinner. It’s solid, honest food which tastes good but suffers a little from vegetarian accompaniment incongruity syndrome. Vegetable and stilton crumble arrives, flanked by both the traditional boiled veg you’d get with a meat dish and a more than usually imaginative salad. And I’ve had many a wedding meal where the flesh-free menu choice has come to the table in a serious state of confusion. But I never thought I’d see peas and grapes on the same plate. On the road in front of us a minibus waits to carry the young people of the village to a grand night out in Chesterfield. We’ve had a kind welcome from Parwich so far, and the beer is holding up well too. Like many a house towards the west of the Peak District, the Sycamore is tied to the Robinson’s brewery of Stockport. 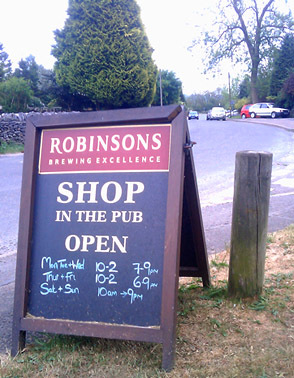 This means there are only Robinson’s beers on the go. But they’re not bad at all: Unicorn, sunshine-flavoured Double Hop, and the formidable Old Tom. At 8.5% abv it’s not exactly a beer for easy summertime quaffing. But you know what they say: when in Rome, have a pint of incredibly strong dark ale. We kick back in the evening sun and start into the easy old ways of fraternal banter and family reminiscence. A local blog, Parwich.org, reveals that the Sycamore has also been used recently as a polling station and the venue for an insurance consultancy session. No, I don’t know what an insurance consultancy session is either. But it all goes to show how a pub can make its way in the world by playing up fully to its role as a focal point for the community. Not just as a local shop but (if you’ll forgive this lapse into quango-speak) as a sort of frontline administrative unit as well, along the same lines as a library or community centre. And why shouldn’t this be a way to a thriving society and a healthier democracy? If we all of us went to the pub to vote, turnout would be up exponentially. If we sat down for a little think about things, pints in hands, before marking our crosses then we might even use our votes more sensibly too. The only contentious issue would be the extent of Old Tom you could spill on a ballot paper before it counts as spoiled. I’m so pleased to read that someone appreciates all the varied activities of an open-to-suggested-services Derbyshire pub.